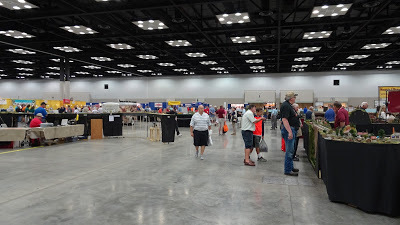 Well we arrived an hour before the doors opened and about 15 minutes before opening of the ticket windows when they opened so we got ours and lined up at the doors. 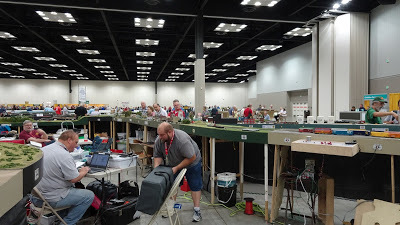 When we got inside – Wow it was huge 180,000 square feet (about 20 times the area of Greyhound park shows). 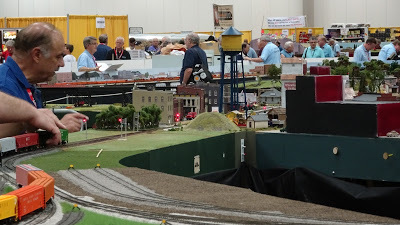 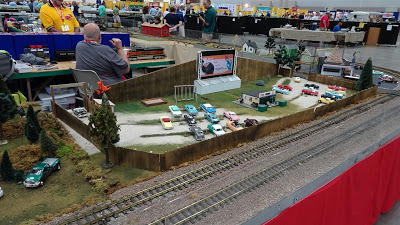 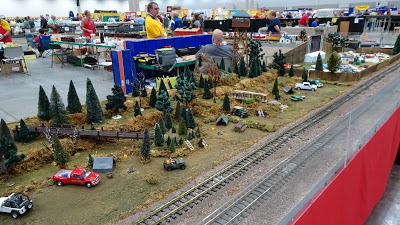 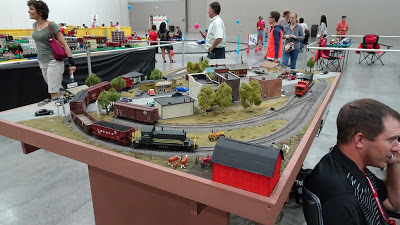 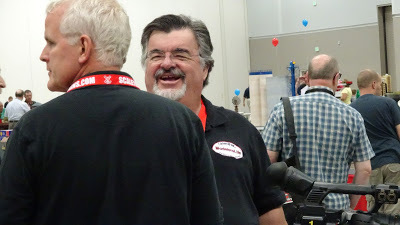 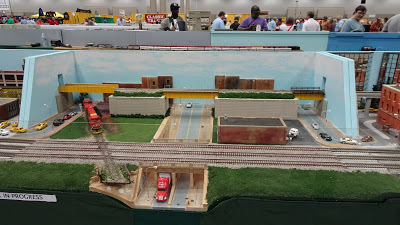 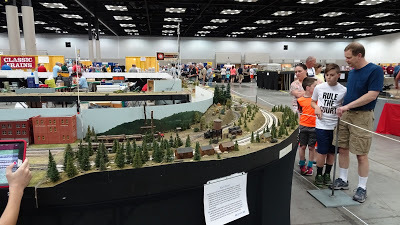 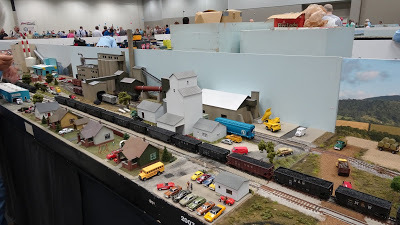 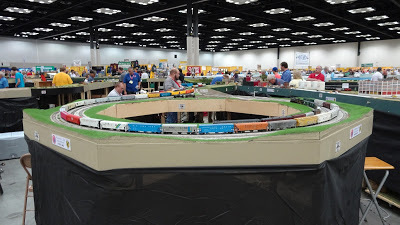 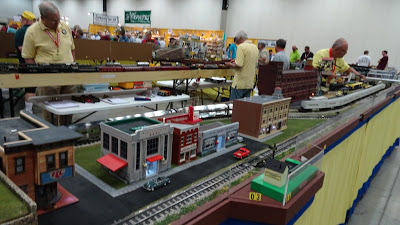 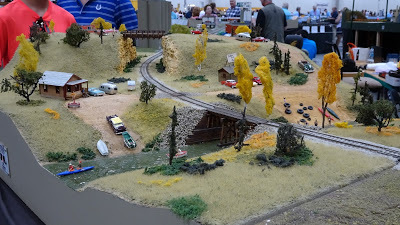 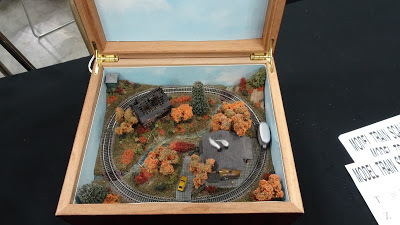 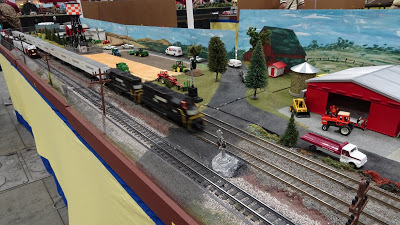 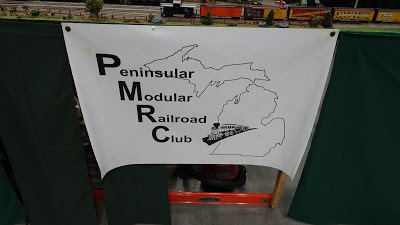 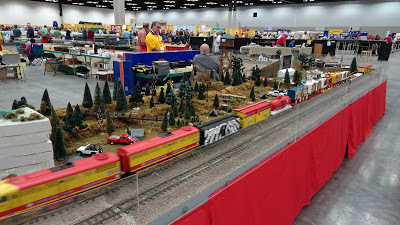 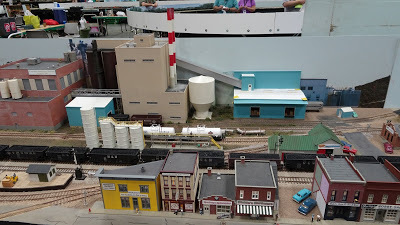 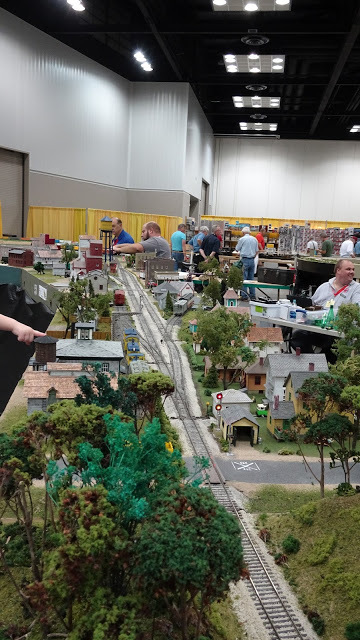 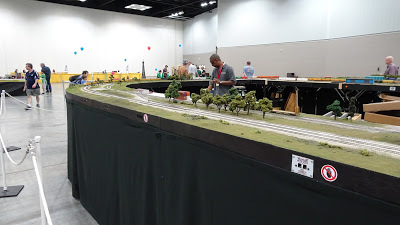 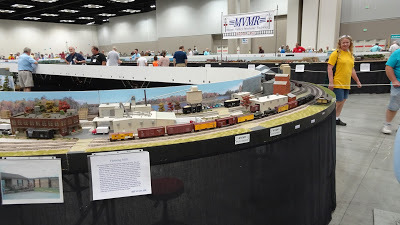 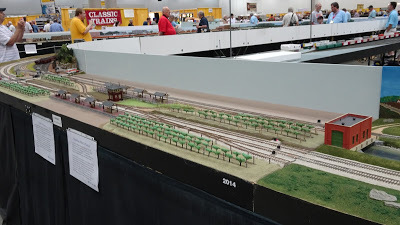 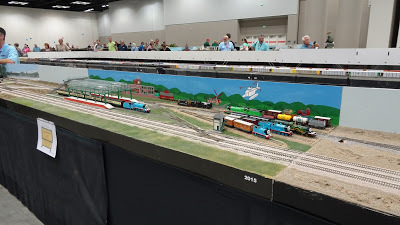 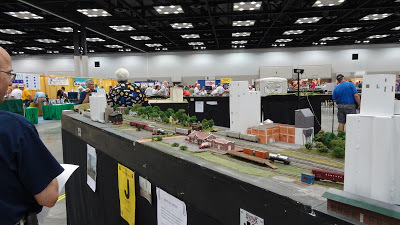 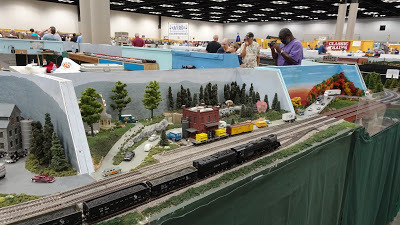 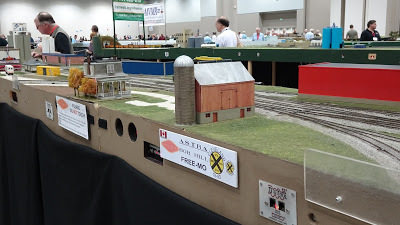 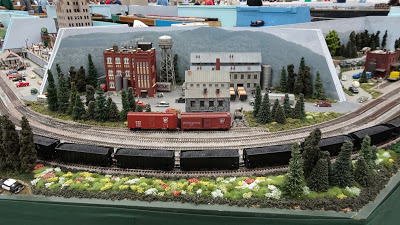 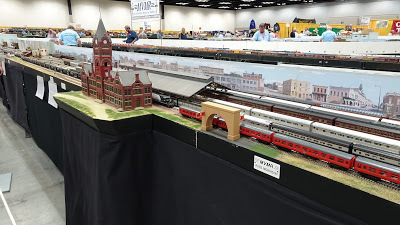 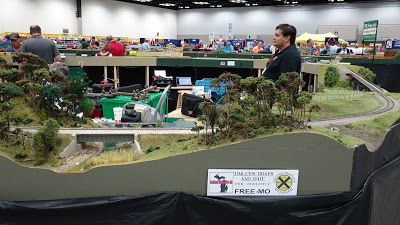 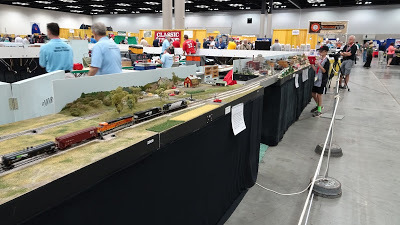 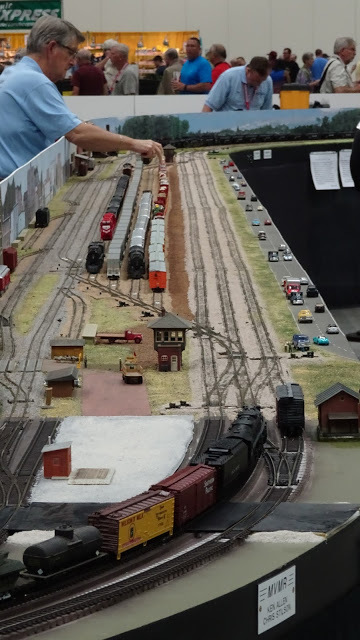 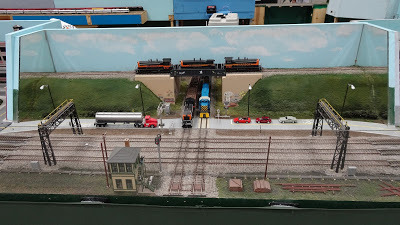 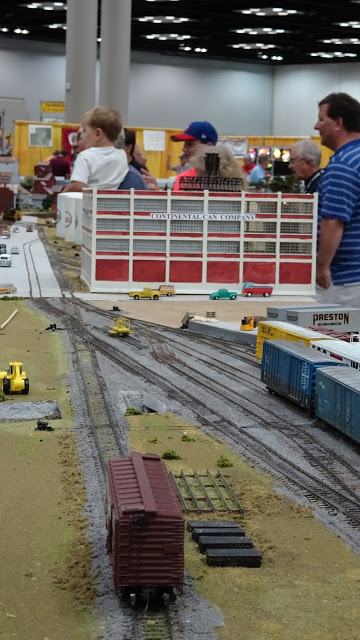 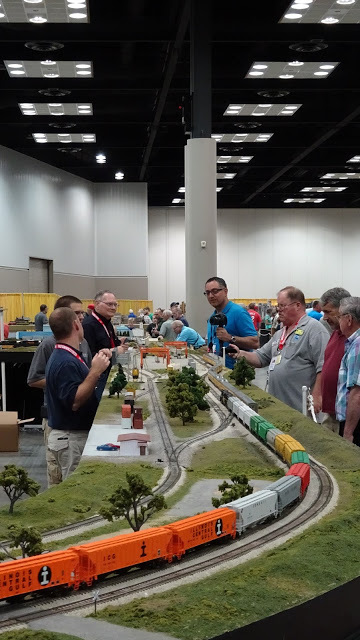 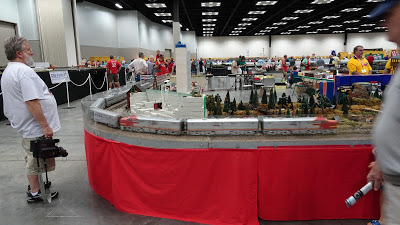 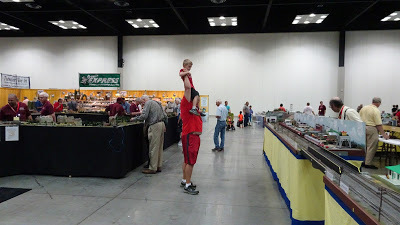 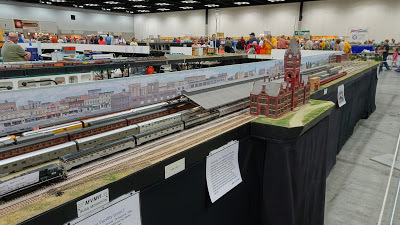 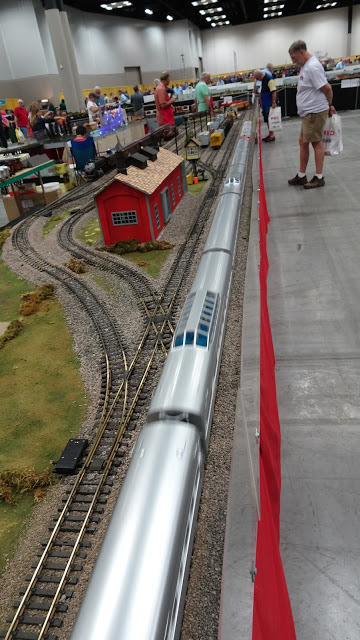 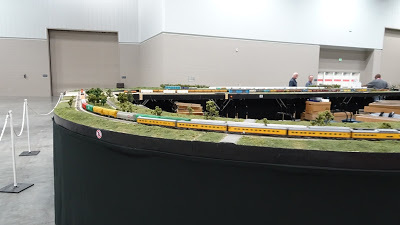 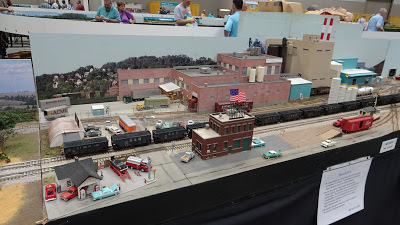 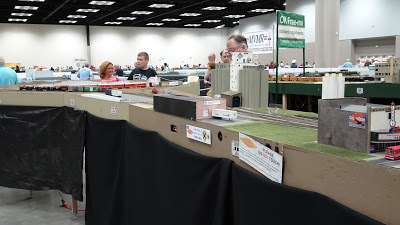 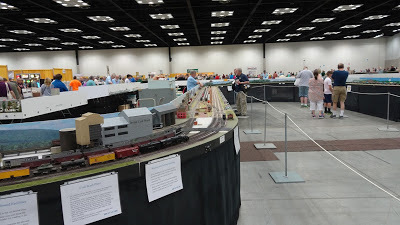 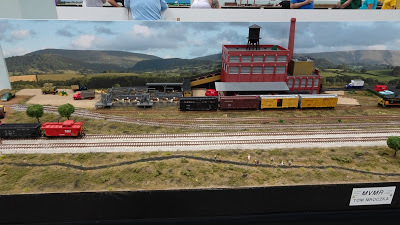 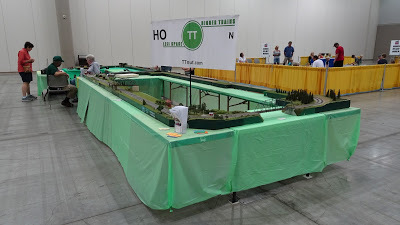 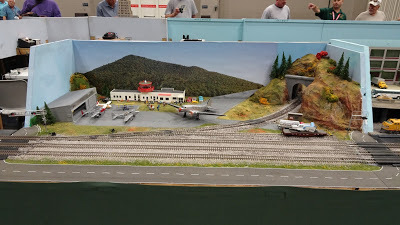 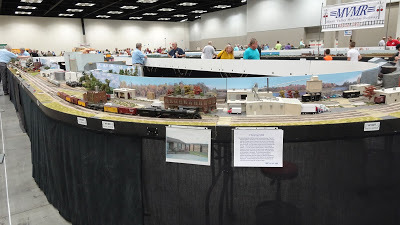 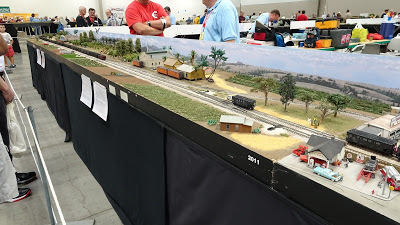 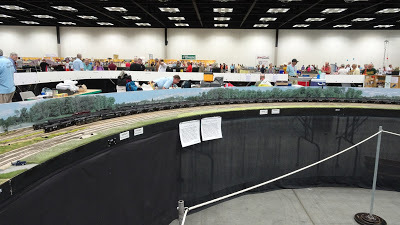 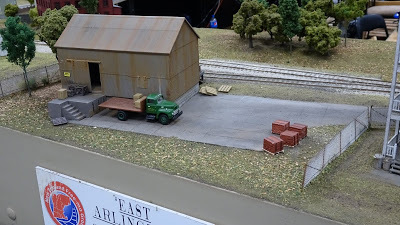 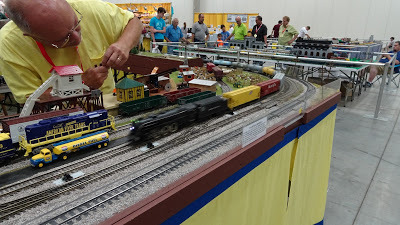 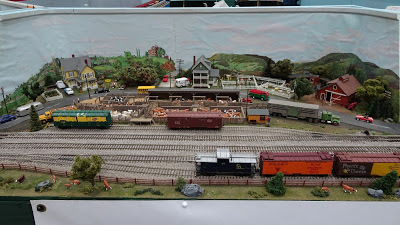 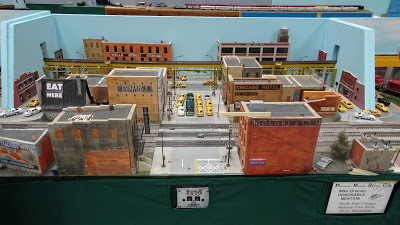 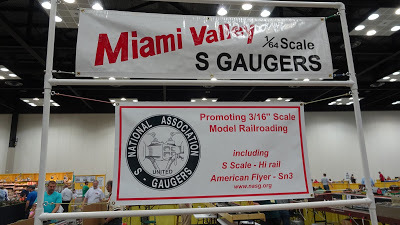 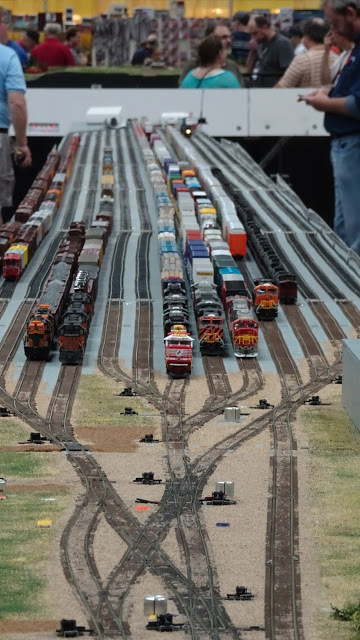 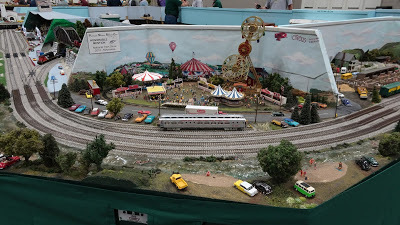 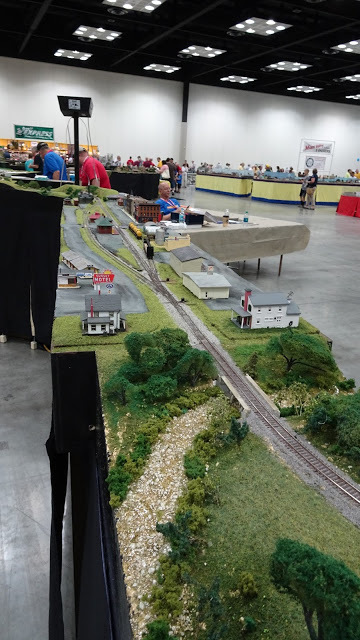 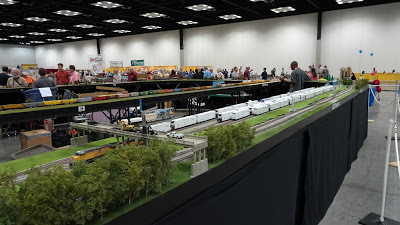 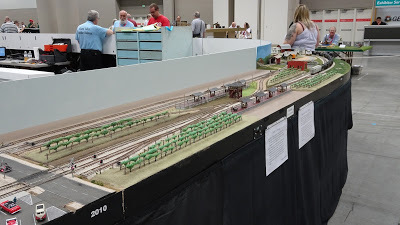 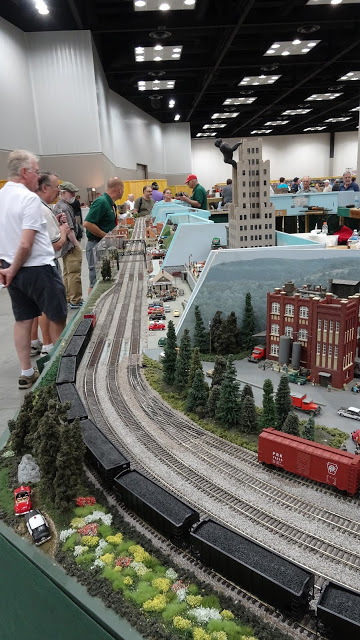 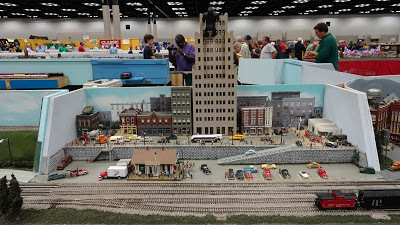 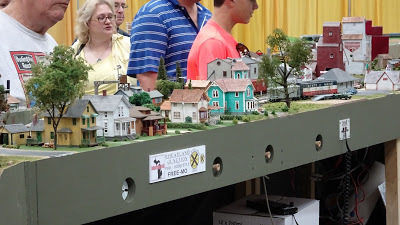 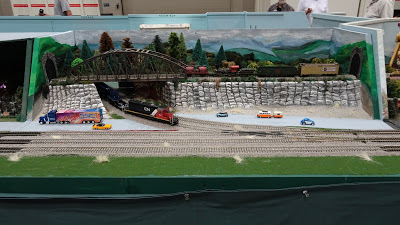 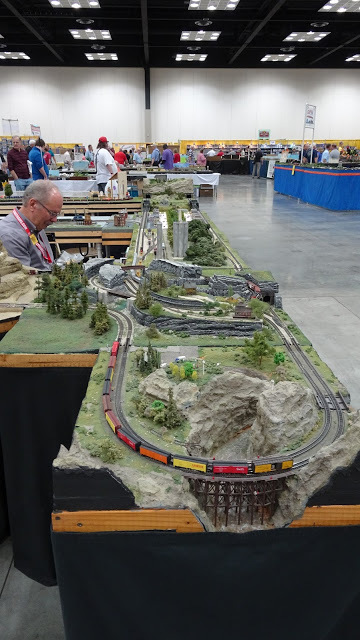 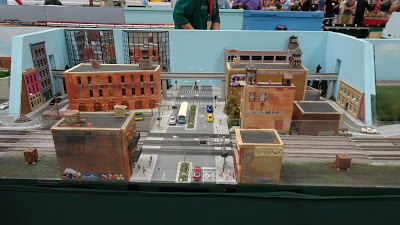 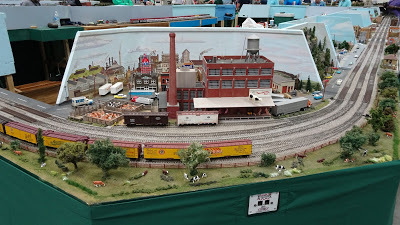 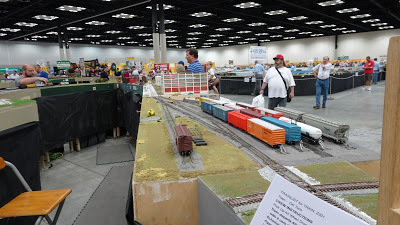 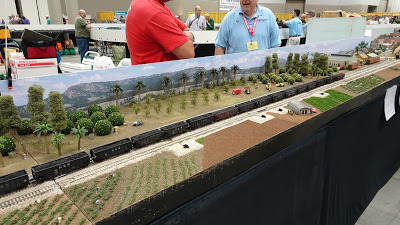 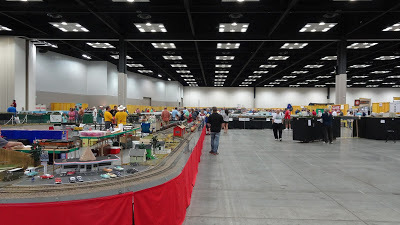 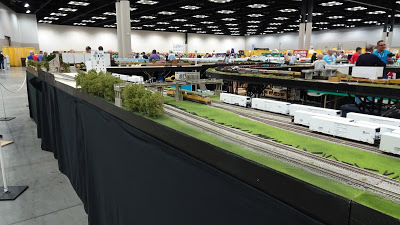 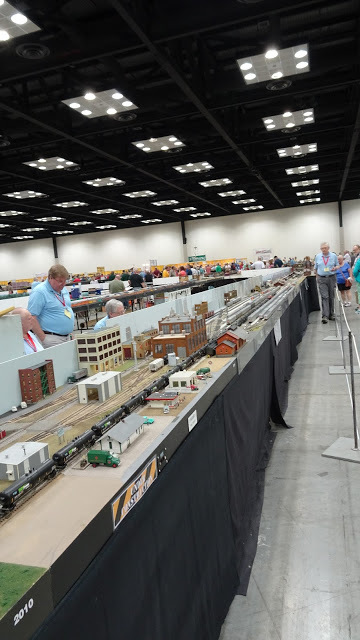 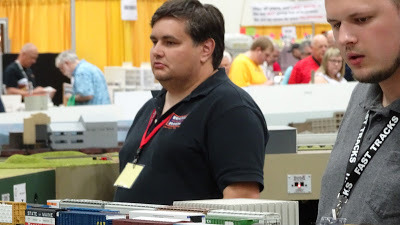 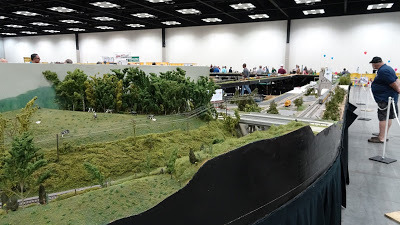 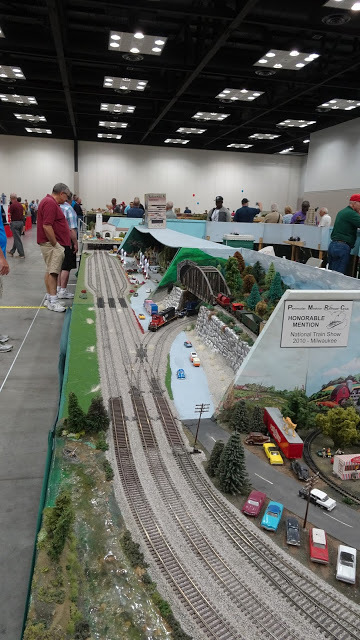 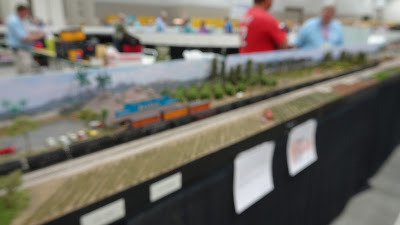 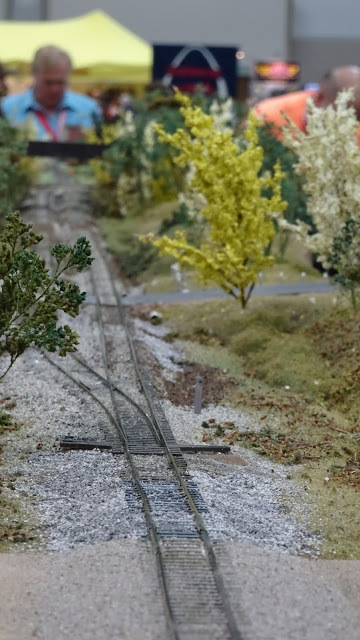 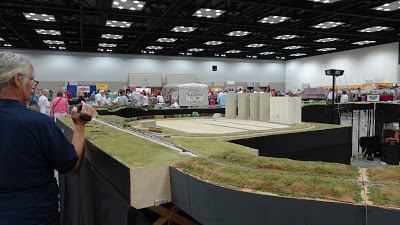 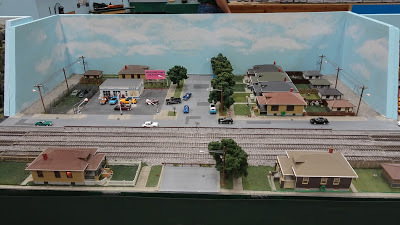 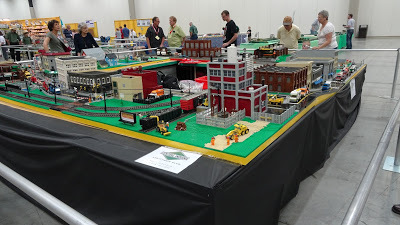 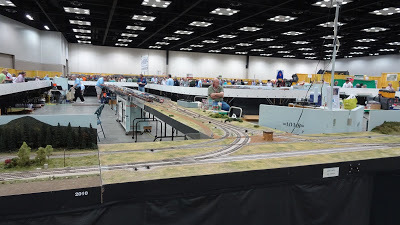 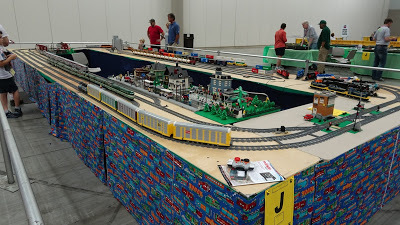 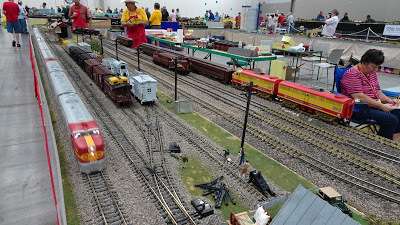 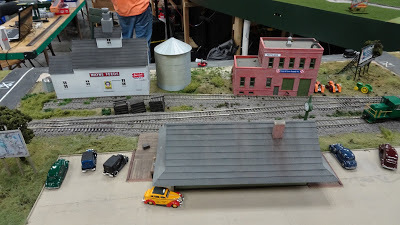 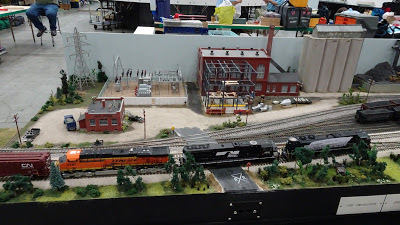 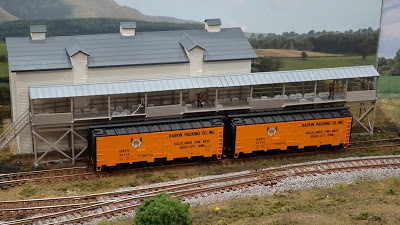 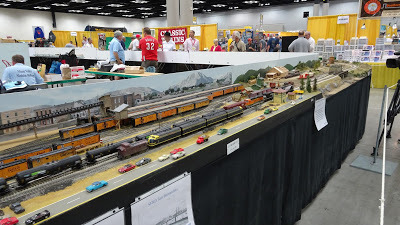 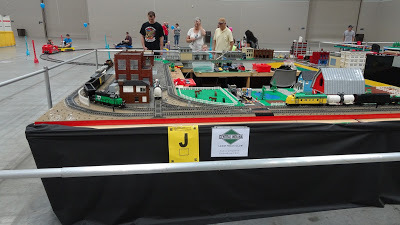 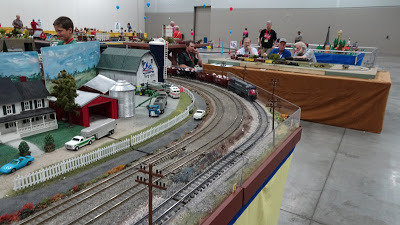 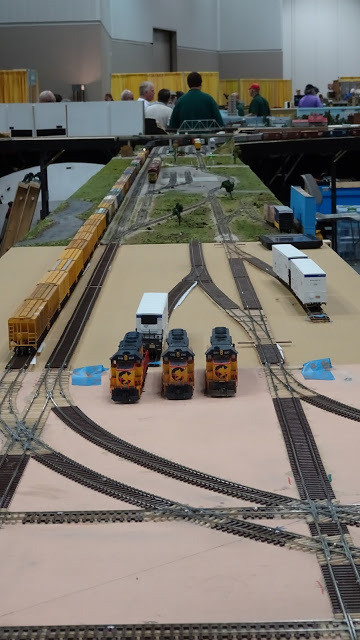 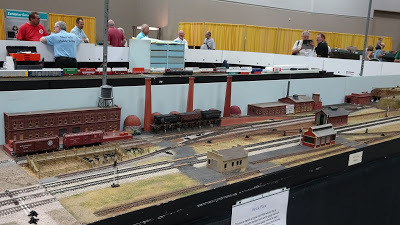 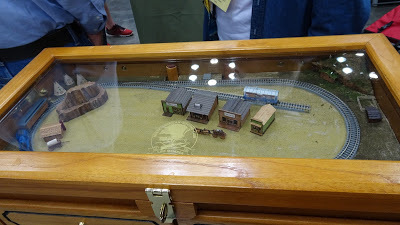 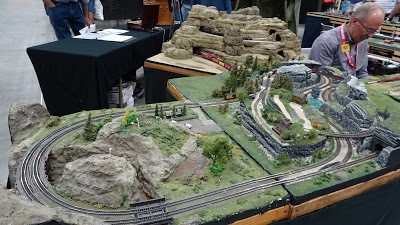 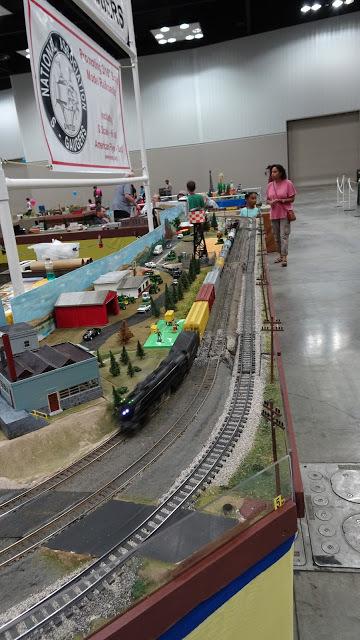 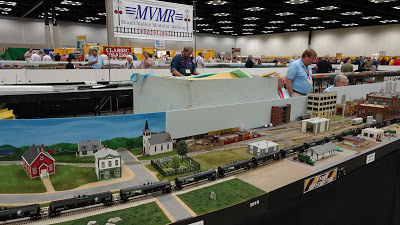 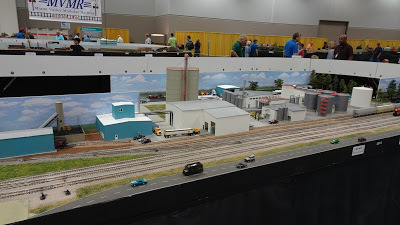 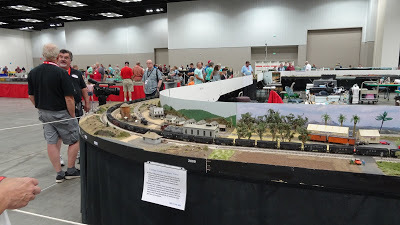 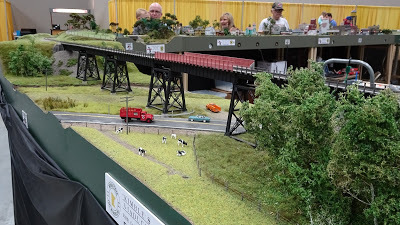 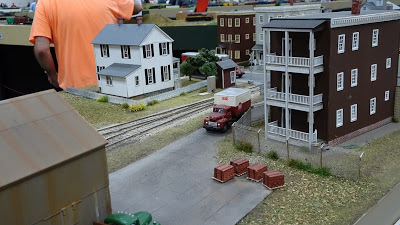 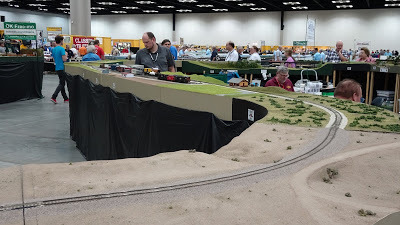 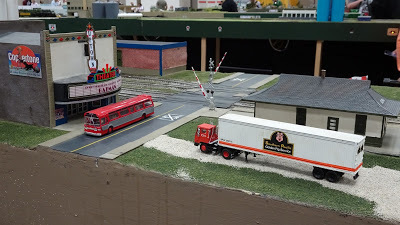 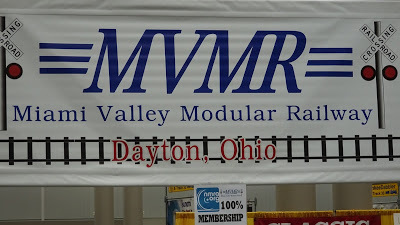 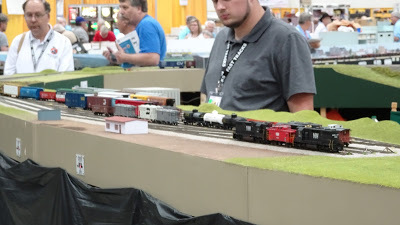 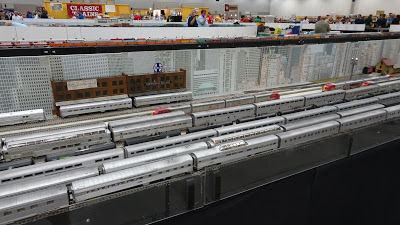 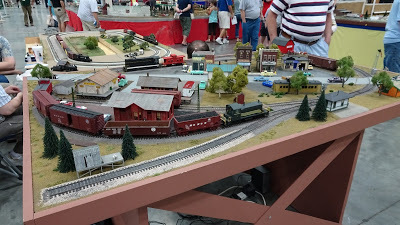 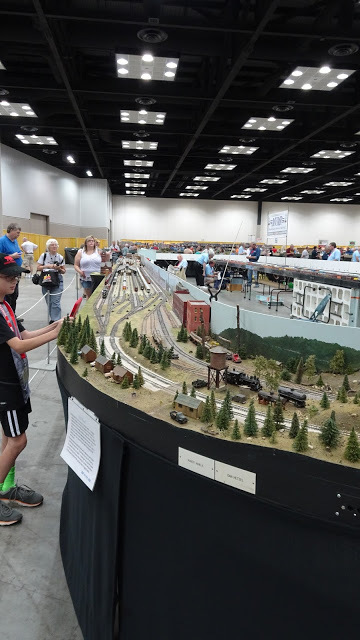 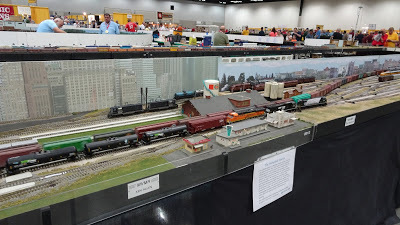 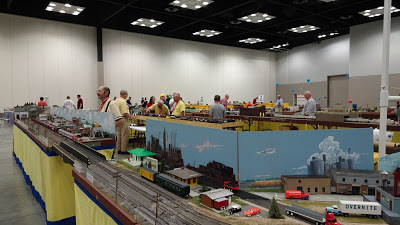 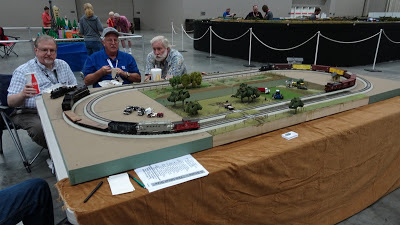 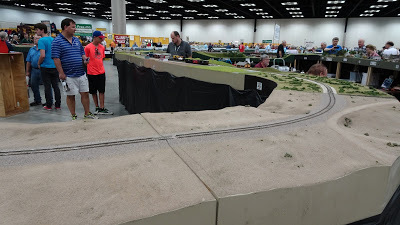 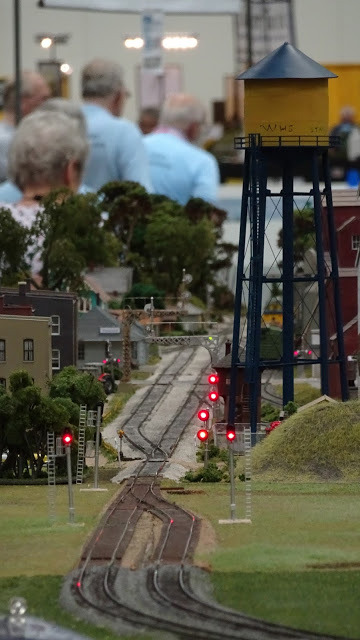 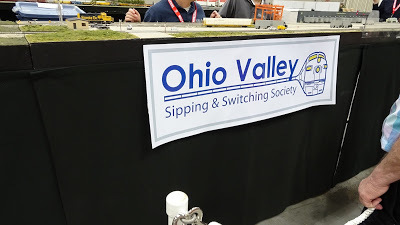 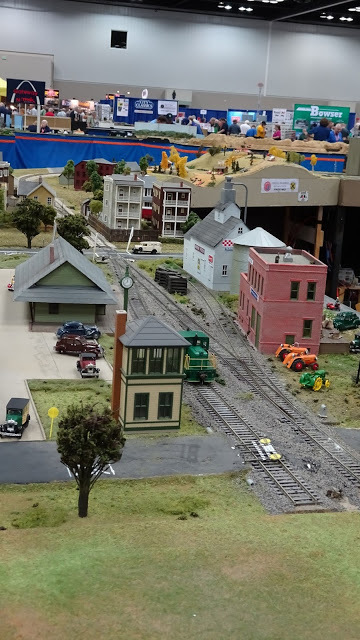 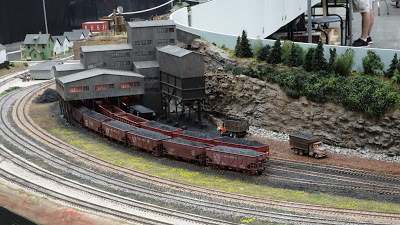 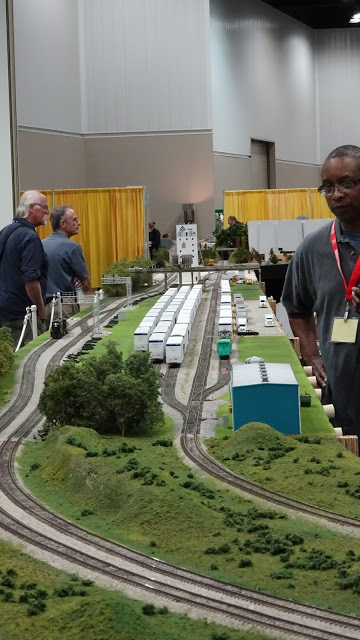 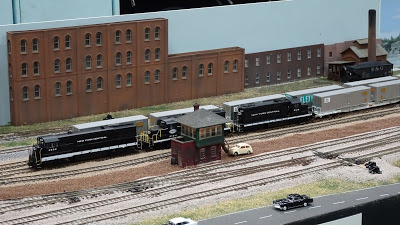 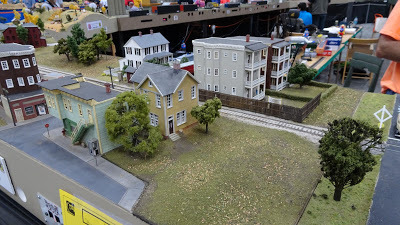 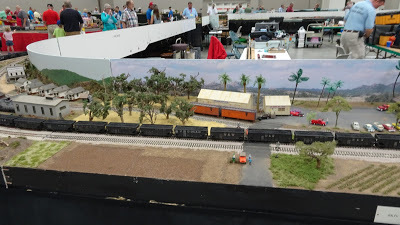 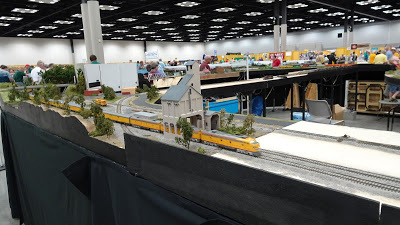 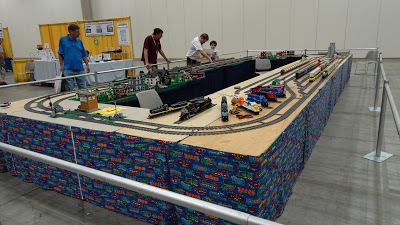 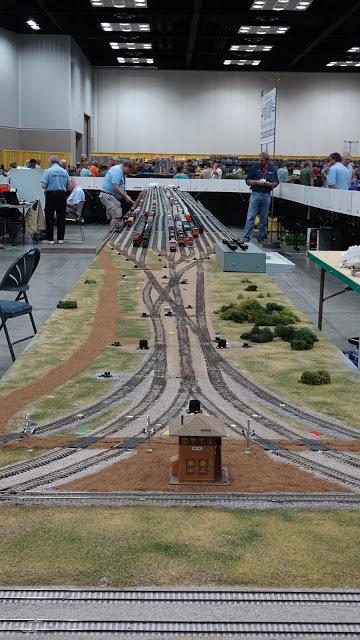 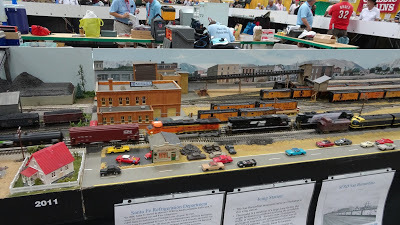 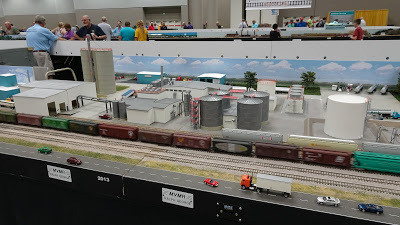 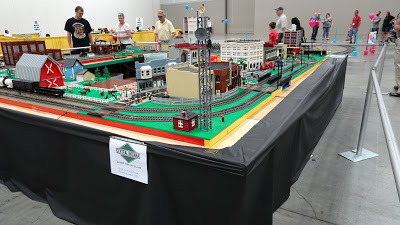 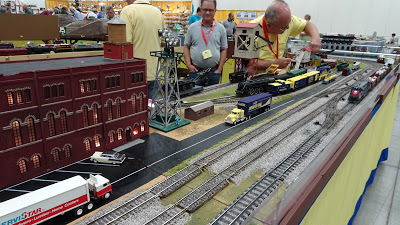 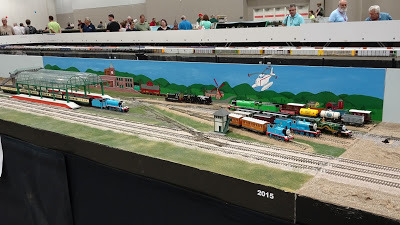 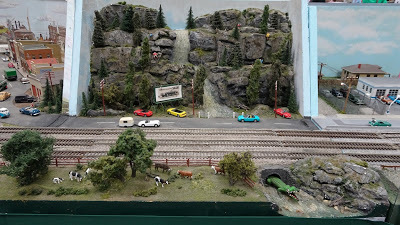 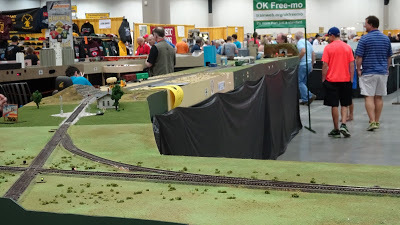 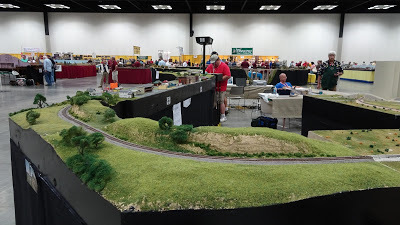 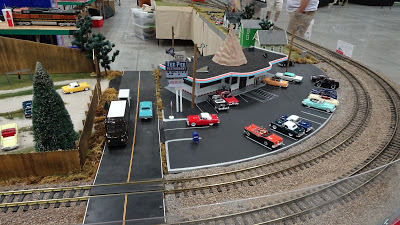 All the major manufacturers were present: Athearn, Atlas, Bachmann, Bowser, Broadway Limited, Caboose Industries, Central Valley, Digitrax, Exactrail, Fast Tracks, Fox Valley, Hornby, Intermountain, K & S, Kadee, Kato, Linonel, Marklin, Micro-Trains, Model Railroad Hobbyist, MTH, NJ International, NCE, Peco, Piko, Scale Trains, Scenic Express, Sound Traxx, Tangent, TCS, Walthers, Woodland Scenics, & ZIMO. 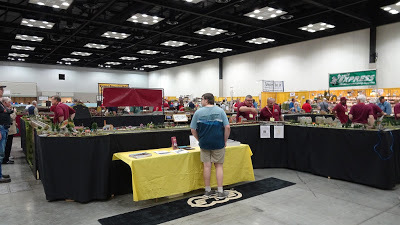 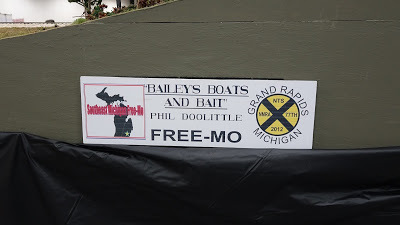 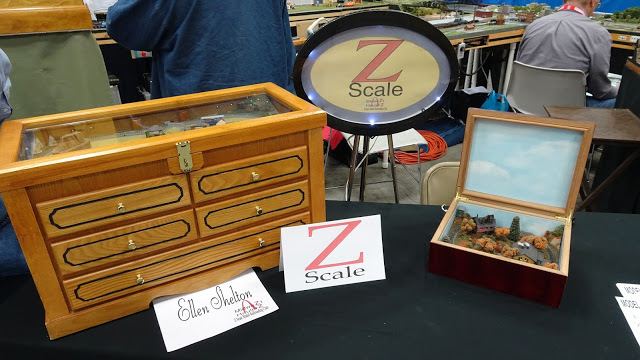 There we another 30 small suppliers and the interesting thing was that if the manufacturer was a wholesaler they could not sell at the show and there were 20 odd hobby shops in separate booths selling their products. 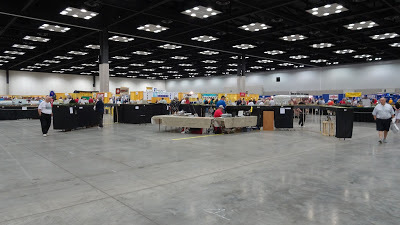 I met and talked to: Miles Hale, Joe Fugate, Jim Rindt, Peter Rindt, Terry Terrance, Mike Slater, Larry Eggering, Jim Scorse & Lionel Strang. 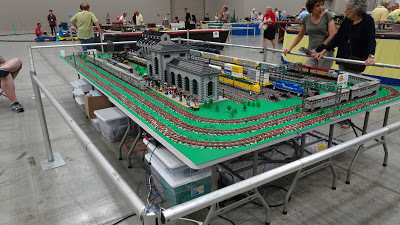 We took about 350 photos and lots of video a selection is below. 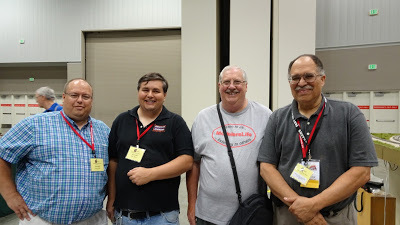 Unfortunately my video overview of vendors was not as clear as I thought it would be…..
Jim Rindt, Mike Slater, Me & Terry Terrance (L to R ).